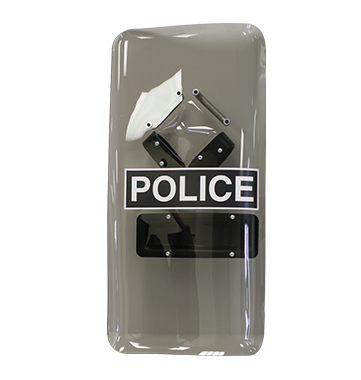 The Handheld Riot Shield (NBS) is designed for use in corrections and law enforcement applications. Particularly effective for crowd and riot control, the NBS is lightweight, shatter resistant and capable of withstanding impacts from bricks, bottles, splash and rocks. NBS units also stand up to all types of swinging strikes. At the National Institute of Justice Annual Mock Prison RiotTM, the NBS absorbed blows from batons, chairs, 2×4’s, and crowbars with no damage to the shield or user. The NBS offers many new and patented features not found on any other shield on the market. It is flexible — capable of being folded in half repeatedly with no creasing damage, and its interlocking edges allow personnel to form a unified, solid barrier with multiple shields. It is also available in right- or left-handed configurations. An ambidextrous model is also available. This model allows the officer to quickly and easily change grip to accommodate weapons or tools, as well as use a two-handed grip for extra reinforcement.